Bulbous tree section lopper: It is used for pruning burl of the bonsai. After being clipped with the bulbous tree section lopper, the tree will leave a concave spherical incision, so that the healing resin of the plant will cover the concave incision. After a long time, no trace of the shear is visible. The incision is flat with ordinary cutting and It is difficult to heal. Even if it heals, it will form a raised burl, affecting the appreciation of the bonsai. Therefore, it is a necessary tool for bonsai lovers. 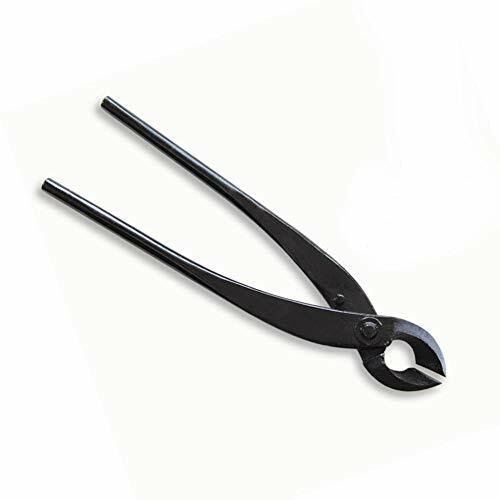 Stalk lopper: Used in bonsai creation, it is a professional auxiliary tool to solve the bending problem of branches. It can effectively avoid the death of the branches due to bending and fracture. After break, you should wrap it with the tape again to protect them and finalize it with aluminium wire. It can easily make the branches of the large Angle bending. It is a necessary tool for landscape artists to create. Diagonal lopper: It is used for pruning fork branches of the bonsai. After being clipped with the diagonal lopper, the tree will leave a concave fish shaped incision, so that the healing resin of the plant will cover the concave incision. After a long time, no trace of the shear is visible. The incision is flat with ordinary cutting and It is difficult to heal. Even if it heals, it will form a raised burl, affecting the appreciation of the bonsai. Therefore, it is a necessary tool for bonsai lovers.